180 records – page 1 of 4. 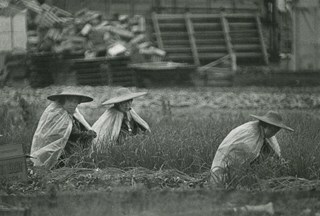 Photograph of three farmers wearing straw hats and plastic shawls working in the rain in an onion field on the Burnaby flats near Meadow Street (now named Meadow Avenue). Newspaper clipping on verso of photograph reads: "WET WORK... Plastic sheets and broad straw hats protect field workers from the cool, wet elements at a farm on the Burnaby flats near Meadow Street this week. More seasonal weather, however, including rising temperatures and clearly [sic] skies, promises that life in the onion fields will be more tolerable, at least for the next little while." Photograph of Richmond Park 'inter-galactic' fun day celebrations where children got together from various parks in Burnaby for fun and games. A group from Lobley Park show off their hand-made rocket. 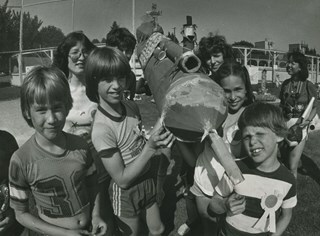 Note on recto of photograph reads: "Lobley Park show off their rocket"
Newspaper clipping attached to verso of photograph reads: "SPACE ANTICS ... Youngsters from various Burnaby Parks gathered at Richmond Park in south-east Burnaby this week to participate in an 'inter-galactic' fun day of costumes and games. 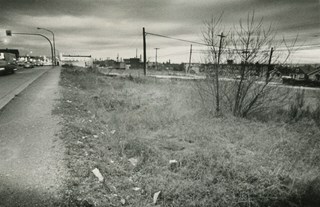 Above, from left, proud group from Lobley Park shows of it hand-made [writing has been cut off]"
Photograph of vacant land, believed to be the 3900 block of Hastings, owned by the municipality. Photograph of a young gymnast working out on the pommel horse. Newspaper clipping attached to verso of photograph reads: "Young BUGS member works out on the "horse". Photograph of a badminton player. She is in the air, and swinging her racket. Photograph of of a woman playing badminton. Photograph of a woman playing badminton. Photograph of Burnaby Central's Jennifer Pearson running to catch up to Hillside's Melody Suchy who is in mid-swing. 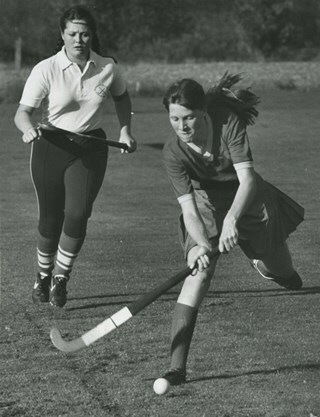 This photograph was taken during a women's high school field hockey game. Photograph of Surrey's Owen Thomas and Port Moody's Jin Kim battling for possession of the ball during a men's soccer game. Note on recto of photograph reads: "OWEN THOMAS - SUR. JIN KIM - PoMo"
Photograph of a Burnaby Central player battling for possession of the ball against an unidentified team's player during a game of men's high school soccer. Note on verso of photograph reads: "BC Soccer"
Photograph of a Burnaby Central player being checked by an unidentified team's player during a game of men's high school soccer. Note on verso of photograph reads: "YOUTH SOCCER"
Photograph of a Burnaby Central player making contact with a St. Thomas player, during a game of men's high school soccer. (Both players are in mid-air). Photograph of a goalie in mid-air as he makes a save during a game of men's high school soccer. Both teams are unidentified. 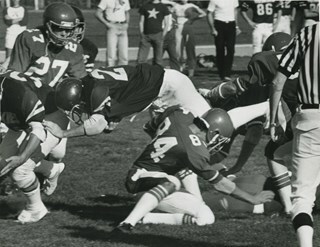 Note on verso of photograph reads: "Local Soccer" and "St. Thomas"
Photograph of a chaotic scrum during a game of football. The teams and players are all unidentified. Photograph of no. 23 of Notre Dame still with possession of the ball after being tackled by no. 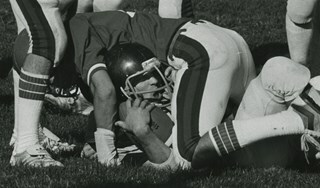 84 of Centennial Secondary during a game of minor league football (No. 84 is on top of the Notre Dame player). Note on recto of photograph reads: "# 22 N.D. (w/ball) # 84 Cent. on top." 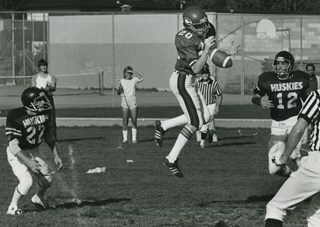 and "Football Minor"
Photograph of a game of Minor league football between Centennial and the Huskies. Note on recto of photograph reads: "Football Minor"
Photograph of a Burnaby municipal engineer crouched down on a bridge over a creek, pointing towards the area where the municipality planned to divert the creek (400 feet away). A newspaper clipping attached to the back of the photograph identifies the engineer as Ernie Olson, but there is some question as to its accuracy. 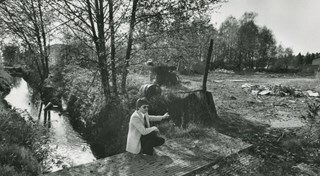 Note on recto of photograph reads: "This Creek will be diverted 400 ft this way"
Newspaper clipping attached to verso of photograph reads: "Burnaby municipal engineer Ernie Olson points to area where creek would be diverted, 400 feet from present site. Photograph of Richmond Park 'Inter-galactic' fun day celebrations where children got together from various parks in Burnaby for fun and games. Paul Ludvigson, 11 years old, is wearing a space man costume. He is from Stride Community School. 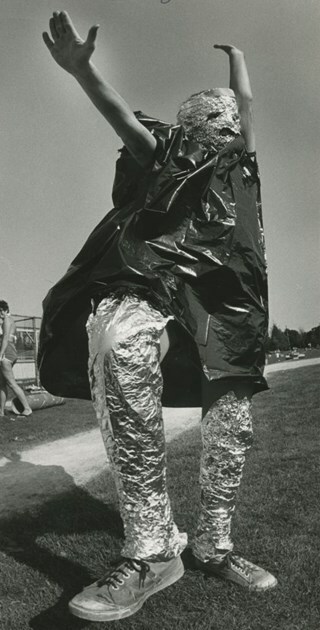 Note on recto of photograph reads: "Paul Ludvigson, 11 (space man) Stride Comm School"
Photograph of Richmond Park 'Inter-galactic' fun day celebrations where children got together from various parks in Burnaby for fun and games. 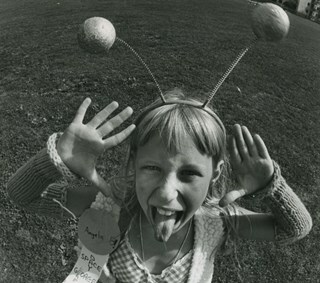 Angela Bell, 10 years old, from George Leaf School is wearing deelie boppers on her head and pulling a face for the camera. Note on recto of photograph reads: "Angela Bell, 10 Geo. Leaf Skool [sic]"
Photograph of mold along a window ledge in a suite in MacInnis Place. After discovering the exessive build up of moisture, home owners protested against the Housing Cooperation of British Columbia (HSBC) and won; HSBC offered to buy back units from owners who were unhappy with their suites. 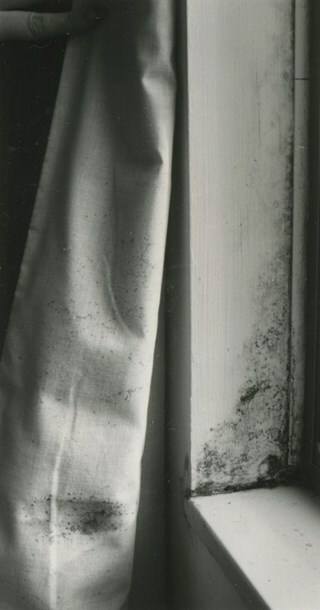 Photograph of mold along a window ledge and curtain in a suite in MacInnis Place. After discovering the exessive build up of moisture, home owners protested against the Housing Cooperation of British Columbia (HSBC) and won; HSBC offered to buy back units from owners who were unhappy with their suites. Photograph of Parks and Recreation Commissioner Richard Smith leading a tour of the proposed Fraser River foreshore park area. Photograph of Barry Christie, then 21 years old, competing in the "open" class by swinging with his body fully extended in a complete rotation around the high bar. This swing is known as the "giant". Note on recto of photograph reads: "BARRY CHRISTIE, 21 ON HIGH BAR COMPETES IN "OPEN" CLASS"
Photograph of Salna Mitha, a Cariboo Hill Secondary School student playing badminton at Burnaby Central Secondary School. 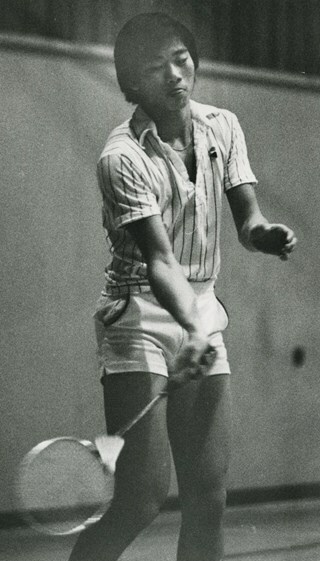 Photograph of Craig Shaum playing badminton. He is swinging his racket under-handed. Photograph of Snezana Blaskovic crouching low to return the birdie during a game of senior mixed doubles badminton. 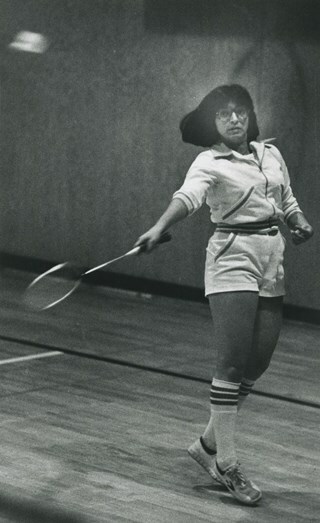 Note on recto of photograph reads: "SNEZANA BLASCKOVIC - SR. MIXED DOUBLES"
Photograph of Brenda Eraut playing a game of senior mixed doubles badminton. Note on recto of photograph reads: "BRENDA ERAUT - SR. MIXED DOUBLES"
Newspaper clipping attached to verso of photograph reads: "Salna Mitha of Cariboo Hill reaches high to return the bird during V and D action Tuesday afternoon at Central." Photograph of defensive coordinator Jim Booth crouching as he runs footwork drills for a local football team. The team is standing around, most have their hands on their hips. The team and players are unidentified. Note on recto of photograph reads: "DEF. CO-ORDINATOR JIM BOOTH RUNS FOOTWORK DRILLS"
Note on verso of photograph reads: "LOCAL FOOTBALL"
Photograph of Simon Fraser University diver Melanie Zarazun. 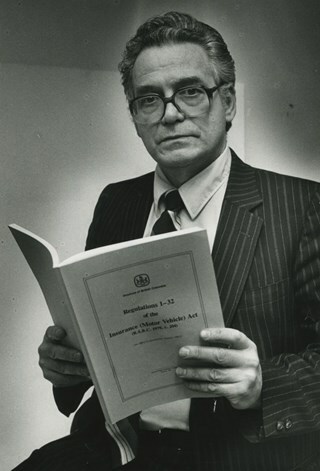 Photograph of Municipal Clerk James Hudson. 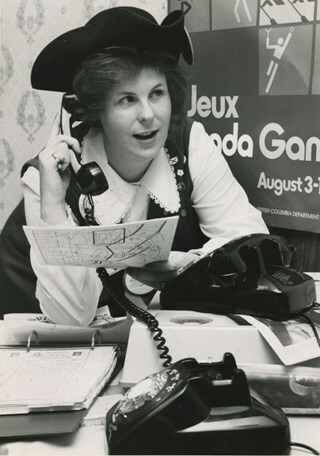 Photograph of Joanna Anthony smiling as she fields phone calls from the media about the Canada Summer Games from the CSG Press Centre at the Villa Motel. 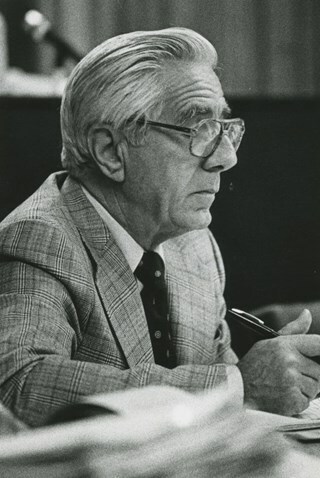 Newspaper clipping attached to verso of photograph reads: "Joanna Anthony fields barrage of questions"
Photograph of Burnaby city planner Don Stenson. Photograph of municipal clerical assistant Bruce Leche. 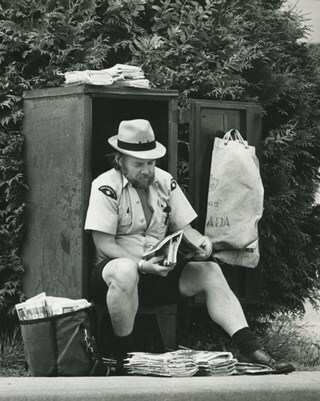 Photograph of Canada Post letter carrier Bob Dahling sitting inside his relay box, taking a break from the heat and sorting the mail he is about to deliver. Newspaper clipping attached to verso of photograph reads: "Bob Dahling at Sperling + Curtis"
Newspaper clipping attached to verso of photograph reads: "BEATING THE HEAT BEAT...North Burnaby letter carrier Bob Dahling pauses for a breather on a muggy afternoon while picking up his workload at the intersection of Curtis and Sperling." Photograph of Burnaby resident Dave Morton with the "Insurance (Motor Vehicle) Act" open in his hands as he looks at the camera. Newspaper clipping attached to verso of photograph reads: "Dave Morton of Burnaby says 'breaches' used to avoid insurance responsibility." 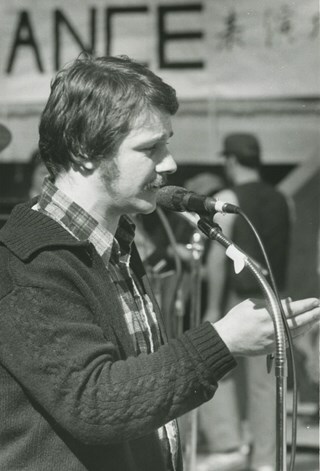 Photograph of Barry Dean, then president of North Burnaby Residents Association, standing up and speaking into a microphone. 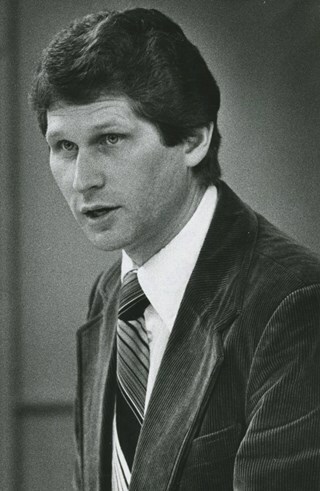 Photograph of Burnaby assistant manager John Plesha. 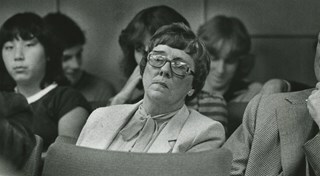 Photograph of musician Colleen Wood sitting at the organ. 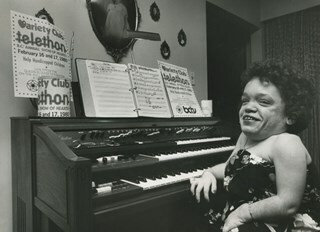 She suffered from a rare muscle disease and was an active member of the Variety Club of British Columbia, donating all funds raised at her concerts to the club. 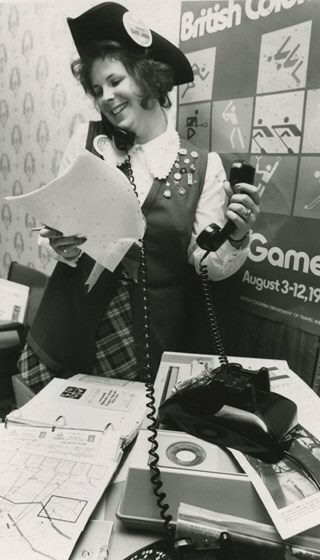 Newspaper clipping attached to verso of photograph reads: "Colleen Wood ... she's working to get a 'sunshine' bus for the handicapped"
Photograph of Simon Fraser University student Ray Paulson standing and speaking at a microphone. He was one of the students opposing the strike, who helped organize the "Learn Rally". 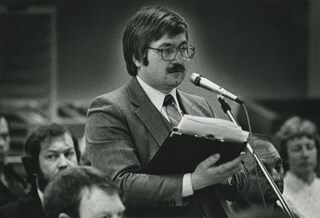 Note on recto of photograph reads: "RAY PAULSON - ONE of ORGANIZERS of LEARN RALLY"
Photograph of the president of the Langley Teachers’ Association, Ken Novakowski, standing and speaking at a microphone, with papers in his hands. 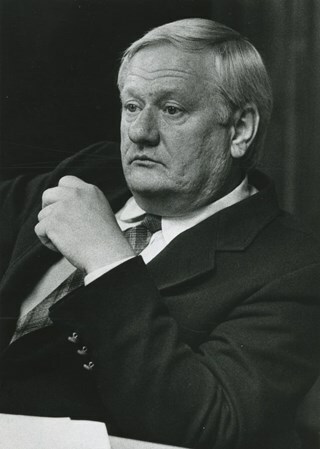 Note on recto of photograph reads: "KEN NOVAKOWSKI - Pres. LANGLEY TEACHERS ASSOC." 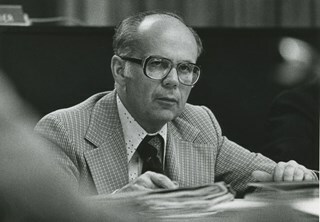 Photograph of Burnaby Director of Engineering, Ernie Olson. 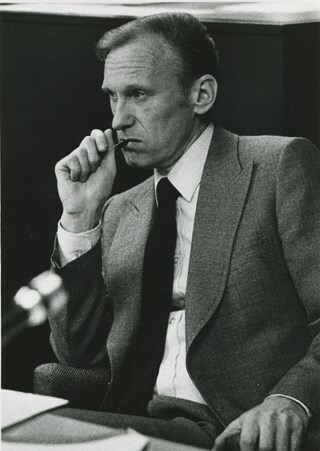 He was the Director of Engineering from 1963 until his retirement in 1989. Photograph of Lillian Mann standing outside her home on Cameron Street. 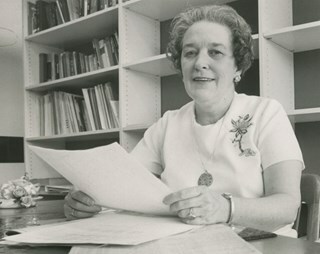 Lillian Mann was a war widow who fought for ownership of her property but the City of Burnaby eventually successfully expropriated the land to be used as part of Cameron Library and Recreation Complex. 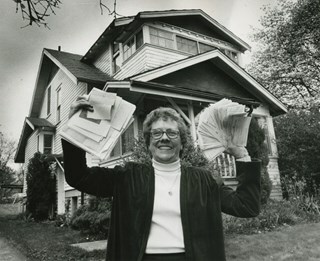 Photograph of Lillian Mann standing outside her home on Cameron Street, smiling as she holds up letters of support from fellow citizens in one hand, and cheques made out to her to help pay for her appeal (the Lillian Mann Defence Fund) in the other. 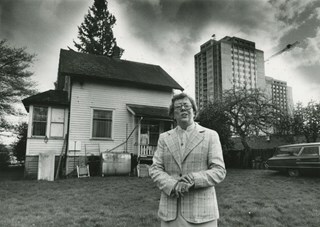 Lillian Mann was a war widow who fought for ownership of her property but the City of Burnaby eventually successfully expropriated the land to be used as part of Cameron Library and Recreation Complex. 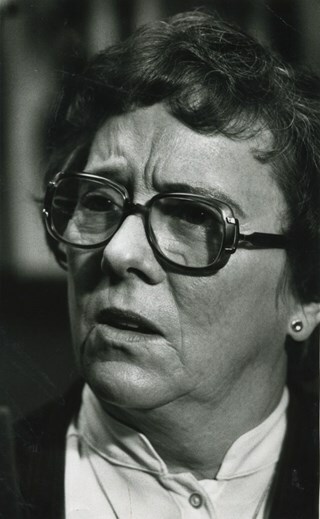 Note on recto of photograph reads: "LILLIAN MANN"
Photograph of Burnaby Health Department supervisor Mary Ross, retiring after thirty-three years of service. 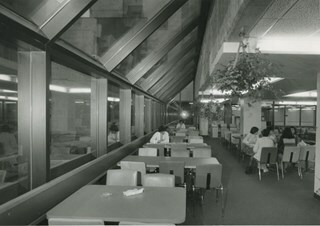 Photograph of the interior of the cafeteria at the Burnaby General Hospital with its wall of windows. Newspaper clipping attached to verso of photograph reads: "Cafeteria at Burnaby General Hospital shows interior lines that helped win hospital architects design award".